Sister Kieran shares her experience being a part of a community in Williamston, NC, where she works closely with the immigrant community. As pastoral ministry they welcome people who have immigrated from places like the Philippines and parts of Africa. When she speaks of immigrants she means many people who come to the US to make a difference for their families. She speaks of people who immigrate because of difficulties at home, from education to health and safety. In Williamston these immigrants are welcomed by 130 interdenominational churches that work together to live the Catholic Social Teachings and serve these people. She identifies a struggle with politicians, where immigrant Americans want to vote but don't have the correct documentation. This struggle has been going on since 1999. 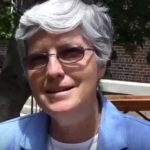 Sister Kieran shares her prayer that there will be changes for our brothers and sisters who are struggling, and she asks for our continued blessings to make a difference.